With the redeveloped SL, Mercedes-Benz continues a tradition that began 60 years ago. The letters "SL" have ever since been synonymous with a symbiosis of sportiness, style and comfort – and with groundbreaking innovations. The new SL has been produced for the first time almost entirely from aluminium and weighs up to 140 kilogrammes less than its predecessor. Its highly rigid all-aluminium body shell provides the basis for agile, sporty handling that has been taken to an entirely new level, coupled with exemplary roll characteristics and ride comfort. Even better driving dynamics come courtesy of the new BlueDIRECT engines; they are more powerful yet at the same time up to 29 per cent more economical than the engines in the outgoing generation. Other new features include the unique FrontBass system, which turns the luxury sports car into a concert hall regardless of whether the top is open or closed, and the highly efficient adaptive windscreen wipe/wash system MAGIC VISION CONTROL; it supplies water from the wiper blade as required and depending on the direction of wipe. 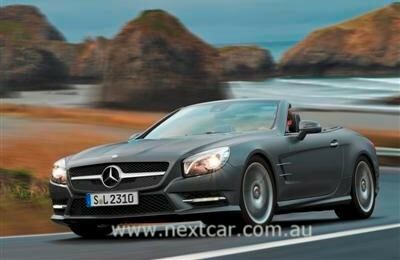 Compared with its predecessor, the new Mercedes-Benz SL offers considerably more comfort and sportiness, setting new standards in the luxury roadster class. Added to which is uncompromising day-to-day suitability, which turns the SL into an incomparable all-rounder among sports cars. In short, anyone that talks about the new SL is bound to be talking about the ultimate in passionate, refined motoring. Dr Dieter Zetsche, Chairman of the Board of Management of Daimler AG and Head of Mercedes-Benz Cars: "There are around 900 million cars in the world and thousands of models. But there are only a handful of automotive icons. Our SL is one of them: it has class, it has style, it is the ultimate in comfort and luxury. But it combines all that with incredible sportiness and dynamism. You would struggle to find a car that embodies Gottlieb Daimler's aspiration more perfectly than our new SL: the best or nothing." 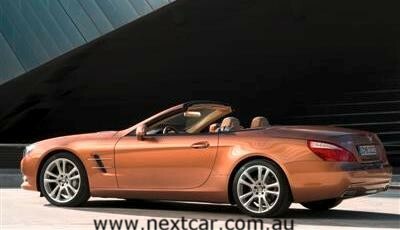 The new Mercedes-Benz SL takes the meaning of the famous letters "SL" – sporty, lightweight – literally. Consistent weight reduction is one of the most outstanding design characteristics in the new SL as was the case in its namesake, the original SL of 1952 with its lightweight tubular frame. For the first time Mercedes-Benz has implemented an all-aluminium body shell in a series-production model. Only very few components consist of other materials. The designers use the even lighter magnesium for the cover behind the tank. High-strength steel tubing is integrated in the A-pillars for safety reasons. The new aluminium body shell weighs around 110 kilogrammes less than it would using the steel technology from the predecessor. "The effect is rather as if a heavyweight-class passenger had got out of the car" says Dr Thomas Rudlaff, responsible for the aluminium bodyshell at Mercedes-Benz. "The result is perceptible and measurable. Less weight means more dynamism and less consumption. In other words: the motoring enjoyment increases, the environmental burden sinks." The aluminium structure is not only lighter but also proves superior to the predecessor's steel construction in terms of rigidity, safety and comfort. This is achieved thanks, among other things, to its intelligent lightweight construction with components optimised for their specific task. Thus, diverse processes are used to make different kinds of aluminium depending on the use the component is to be given: the parts are made by chill casting or vacuum die-casting, worked into extruded aluminium sections or into aluminium panels of different thicknesses. The result: high rigidity, high safety levels and better vibration characteristics. 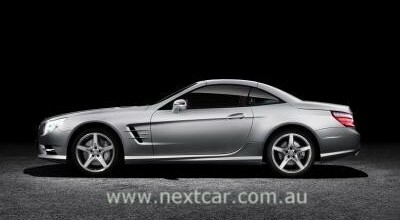 Although the new Mercedes-BenzSL is even more comfortable and has more assistance systems on-board than its predecessor and therefore does actually sacrifice some of the weight saved through the aluminium body shell, the scales show some astonishing figures: the new SL 500 (1.785 kg) weighs around 125 kilogrammes less than its predecessor. The SL 350 (1.685 kg) is even 140 kilogrammes lighter – all thanks to a host of other enhanced details to reduce weight, which Mercedes-Benz has also implemented in the new SL in addition to the aluminium body shell. Powerful while accelerating, effortlessly superior across all speeds, nimble on winding roads – the new Mercedes-Benz SL provides ample driving pleasure. Apart from the powerful engines, the sportily tuned yet comfortable suspension, which also boasts intelligent lightweight construction, proves outstanding. For instance, the steering knuckles and spring links on the front axle are also made out of aluminium to reduce the unsprung masses. The same also applies to virtually all the wheel location components on the rear axle. The new V8 in the SL 500 develops 320 kW (435 hp) from its displacement of 4,663 cc and thus around 12 per cent more than its predecessor despite some 0.8 litres less displacement. The fuel consumption has been reduced by up to 22 per cent. At the same time, the torque has increased from 530 Nm to 700 Nm – a gain of 32 per cent. Although the displacement remains the same at 3,499 cc, the new V6 engine in the new SL 350 develops 225 kW (306 hp) and delivers 370 Nm of torque. It uses just 6.8 litres of fuel per 100 kilometres, making it almost 30 per cent more economical than its predecessor. Both engine variants come with a standard-fit ECO start/stop function. The 7G-TRONIC PLUS automatic transmission, which has been optimised in relation to fuel consumption and comfort, also contributes to the exemplary, low fuel consumption. The fuel economy of the BlueDIRECT engines takes nothing away from the roadster's raciness. Quite the contrary: the SL 350 accelerates from 0 to 100 km/h in 5.9 seconds, making it three tenths of a second faster than its predecessor. The SL 500 takes just 4.6 seconds – eight tenths less than the previous SL 500. Compared with its predecessor, the new generation of the SL is much longer: 4,612 mm (+50 mm) and wider 1,877 mm (+57 mm), providing more room for more comfort in the interior, too. Shoulder room (+37 mm) and elbow room (+28 mm) have been increased, exceeding the dimensions normally found in this vehicle class. Clear lines provide a formally coherent internal space within this comfortable interior. Generously used wood trim extends from the centre console across the dashboard into the doors, creating a pleasant wrap-around effect. Three types of wood along with two different aluminium trim finishes are available. Perfectly in tune with the roadster's character, it combines the unpretentious atmosphere of a high-performance sports car with a comfortable, stylish ambience one comes to expect in a luxurious touring car. The sixth generation of the SL also offers a vario-roof that can be retracted into the boot using an electrohydraulic mechanism to save space, which converts the SL in a few seconds into a roadster or a coupé, depending on the driver's wishes and the weather. Unlike its predecessor, three versions are available for the new SL: painted, with glass roof or with the unique panoramic vario-roof with MAGIC SKY CONTROL. The transparent roof switches to light or dark at the push of a button. When light it is virtually transparent, offering an open-air experience even in cold weather. In its dark state the roof provides welcome shade and prevents the interior from heating up in bright sunlight. 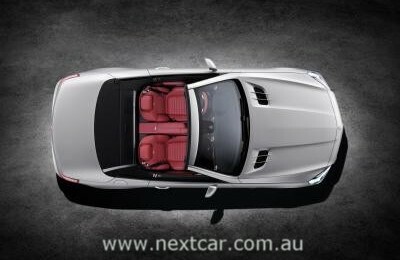 The frame of the three roof versions is made of magnesium, making the roofs around six kilogrammes lighter than the roof on the predecessor, thus providing a lower centre of gravity for the vehicle and, in turn, better agility. The design of the new SL not only meets high aesthetic demands but it also boasts exemplary aerodynamic qualities. Thanks to the crash-optimised aluminium structure, standard-fit PRE-SAFE® and assistance systems on the same high level as the S-Class, the SL is the world's safest roadster. The rigid aluminium body shell forms a sturdy passenger compartment along with precisely defined deformation zones in the front and rear ends. In the event of the vehicle overturning, A-pillars made out of a mix of steel and aluminium and two roll-over bars protect the passenger compartment. The restraint systems including the two-stage driver and front passenger airbags have been further developed. A headbag integrally covers the side head-impact area. An additional thorax airbag in the seat backrest can protect the upper body in the event of a side impact. Another new feature is the crash-responsive NECK-PRO head restraints developed by Mercedes-Benz which are fitted as standard in the SL. An active bonnet and a front end with a large, yielding impact area help ensure pedestrian protection. Even in the entry-level variant, the new Mercedes-Benz SL comes with the "Cockpit Management and Data System" COMAND. Functionality includes Bluetooth telephony along with simpler operation of the car phone. COMAND Online with internet access and DVD changer is also available as an option. It provides unlimited web browsing while the vehicle is stationary along with high-speed access to a Mercedes-Benz on-line service – for instance requesting a weather report or a special destination search. There is also the option of sending individual destinations and routes via Google Maps to the vehicle. For the first time, Mercedes-Benz is also offering new 'apps' for the new SL: in addition to a free news app, there are optional Mercedes-Benz apps for share prices and a car park finder. An app to look for restaurants is available for the US market. To coincide with the launch of the new SL, Mercedes-Benz will also be offering a special-edition model, the "Edition 1", for a limited period. The "Edition 1" is superbly equipped and comes as standard with a panoramic vario-roof, AMG bodystyling, sports suspension, AMG 19-inch light-alloy wheels, designo nappa leather with contrasting top stitching, AIRSCARF, heated seats, electric draught-stop, ambient lighting and Harman/Kardon® Logic7® surround sound system and much more. The designo crystal silver magno special paintwork is available exclusively for the "Edition 1", along with trim in wave or deep white aluminium. Stay tuned to Next Car for an announcement, in due course, regarding the local release date, prices and specifications.